I am a recent arrival in the Disciples family. After attending my local Disciples church for about a year, I finally became an official member on Christmas day 2011. I was raised in a small, extremely conservative church (members were not allowed to own televisions or wear shorts, for example), and so this is quite a change for me, but a welcome one. I identify as a lesbian, and I have since I was thirteen years old. I had been taught that gays were “evil,” and so I prayed for years to change, but it didn’t happen. Growing up gay in a relatively large city (Pittsburgh, PA) I am sure that there were out, happy gay people around me. But I never saw them. I am sure there were supportive youth groups I could have benefited from, but I never heard of them. I am sure there was even a church somewhere (maybe a DOC church) that would have let me know that God created me and loved me just as I was, but I wasn’t aware of it. The result was that I left the church, avoided God’s call and believed I had to navigate the transition to adulthood alone. It was a lonely place for a gay kid to be. It is a place that many gay kids are in right now. I’m thankful that I did eventually find one of those churches, and I am answering God’s call with the support of an amazing church family here in Lynchburg, VA. 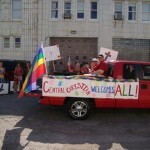 Some friends and I recently began a ministry to reach out to LGBT folks in our area. The hardest part of this process has been finding ways to reach the people who are the most vulnerable and isolated, and could probably benefit from our group the most. Lynchburg is a very, very conservative town. The landscape and the culture are dominated by Liberty University, an institution whose stance on gay people is that we are a blight on society, an abomination before God, and can be changed with enough willpower and counseling. While there is certainly a gay community here, it is primarily a closeted one. Coming out publically could literally (and sadly, legally) cost people their livelihood. I understand and strongly agree that it is important to be respectful of one another. It is important to keep the peace. If there is one thing I love about my new church, other than the open-armed welcome, it is the fact that we value one another enough to listen and allow for difference. It is vital to respect different views, and to not try and trample others with our own. Patience is a very good thing. Discernment takes time. However, as I hear about the struggles within our denomination over how explicit to be in our affirmation of our LGBT brothers and sisters, I can’t help but think of those people who need help now; who simply need to know that God loves them, right now. I would make the argument that it is vital for those of us who are supportive of LGBT people, particularly those of us involved in the church, to be loud ENOUGH; to use a term from the verse above, to be bold ENOUGH. Loud enough that the kid sitting in the back row of a class at a local high school believing God hates him for who he is, hears us. Loud enough that the young woman who has been put out on the street by her family for who she loves hears us. Bold enough that the students at Liberty University who are afraid for their friends hear us. Bold enough that maybe we CAN be known far and wide for our love, even in a situation where we might not completely understand. Who knows if one more attempt at advertising the fact that a church was open & affirming would have reached me? I may have spent less time hurting and running and more time growing and working. Maybe one more slightly louder voice could have made the difference. Maybe one more person, one more organization, one more church, willing to speak out can make the difference to someone right now. This is not a simple process. I think that there is still room for discussion, and education, and coming to agreement will take time. However, while we are doing this work together, I for one will be praying as the earliest members of the church did — praying for boldness in speaking the truth — praying for the courage to make our voices loud enough.